Twenty-two planes made it through the training undamaged. Those crews and planes departed for their west coast rendezvous with the USS Hornet in late March. The Raiders flew their aircraft to McClellan Army Air Field in Sacramento then onto Alameda NAS. These days in California gave the pilots the last chance to hone their low-level flying skills as their aircraft underwent a final round of maintenance. No self-respecting pilot would give up the chance to buzz this West Coast icon if the opportunity presented itself. 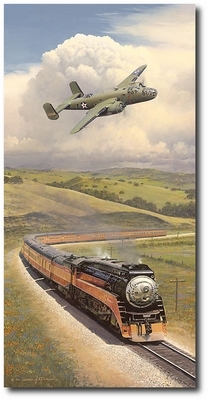 Here, Colonel Doolittle chases the Southern Pacific Daylight just before departing on his historic raid.